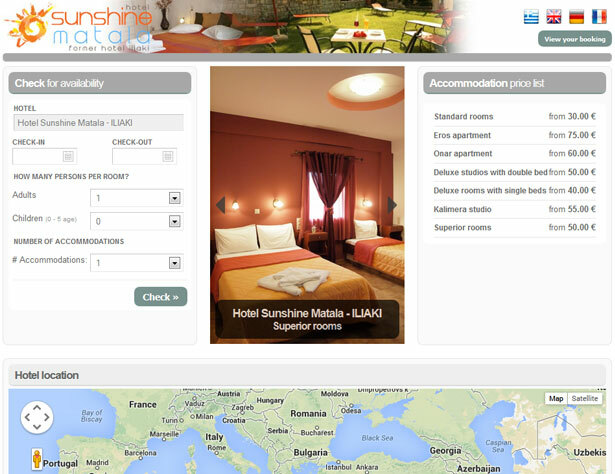 Check Bookings for hotels, B&B, apartments, villas & camping | The ultimate booking engine! a friendly and easy to use environment! Many famous hotels successfully use it! The administration is friendly and easy to use by making your life easier! 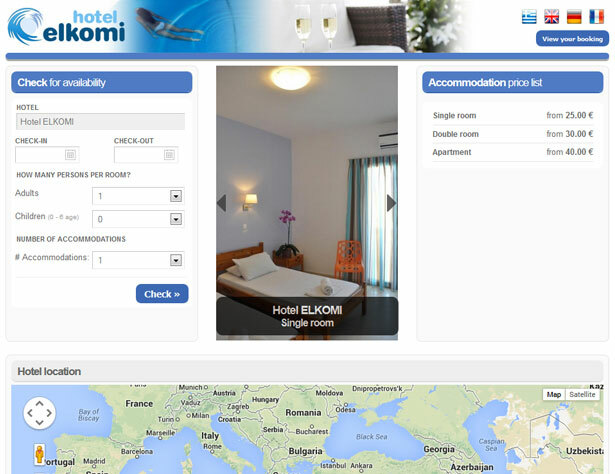 There isn't any faster way to check the availability plan of your hotel! or stop sales even in all types of accommodation provided without any commitment. 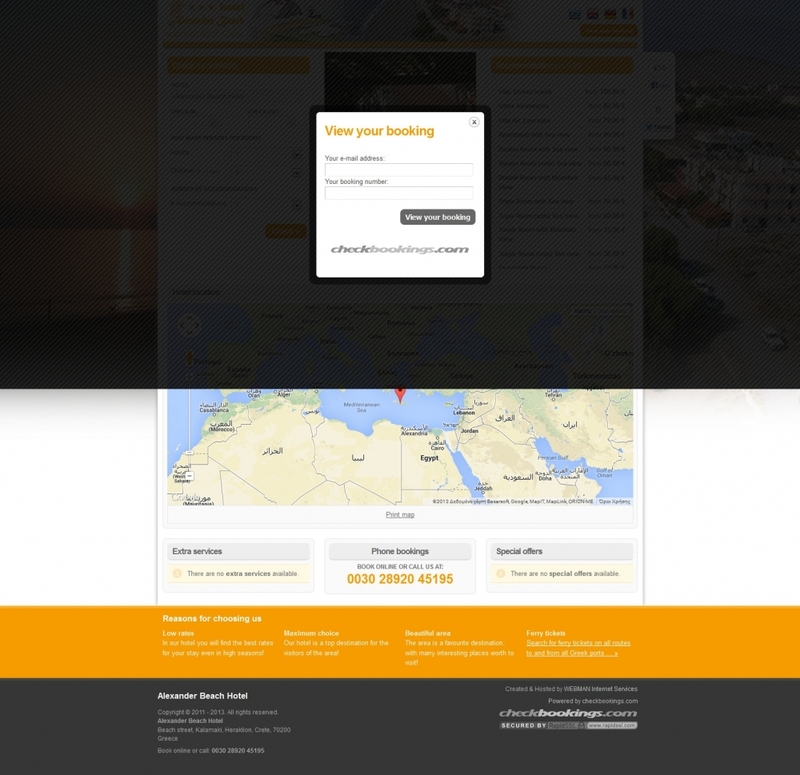 Check bookings is a modern online booking system through a friendly and easy to use environment! 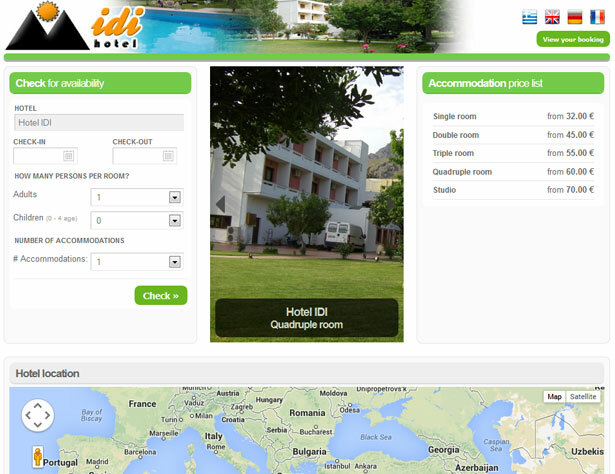 It fully supports international standards of dynamic content management and data security of your bookings. Maximize your sales by receiving direct bookings through your website & facebook page. 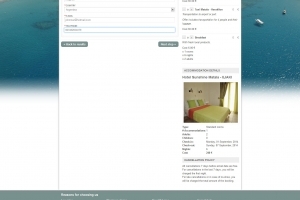 Manage your bookings by adding your own bookings through the admin panel, free of charge. 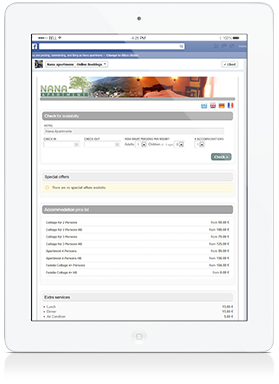 Get notified for new bookings through e-mail and sms messaging on your mobile phone. The service is constantly evolving with new features and upgrades free of charge! 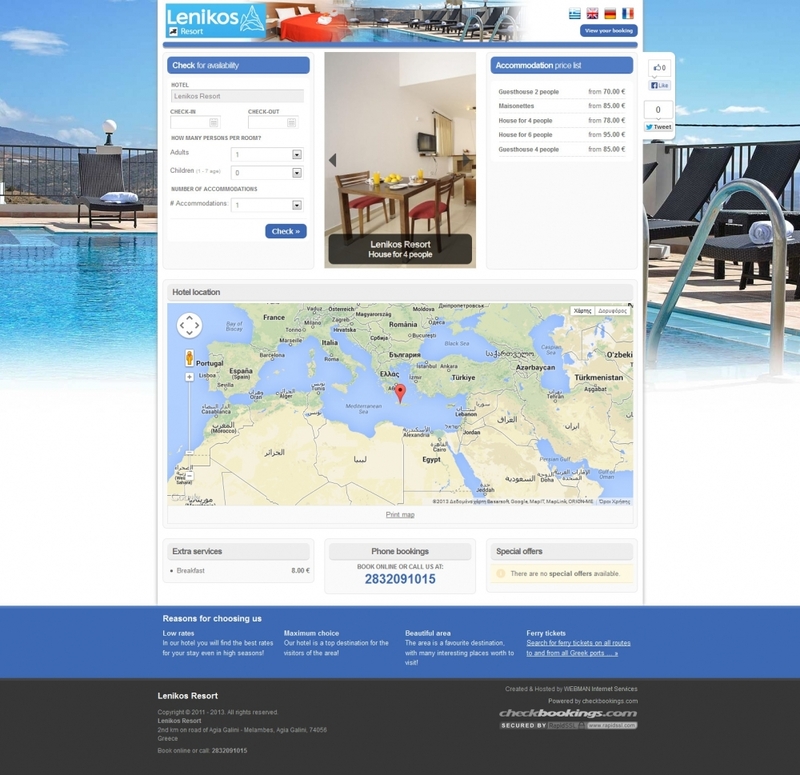 A modern platform for professional hoteliers! 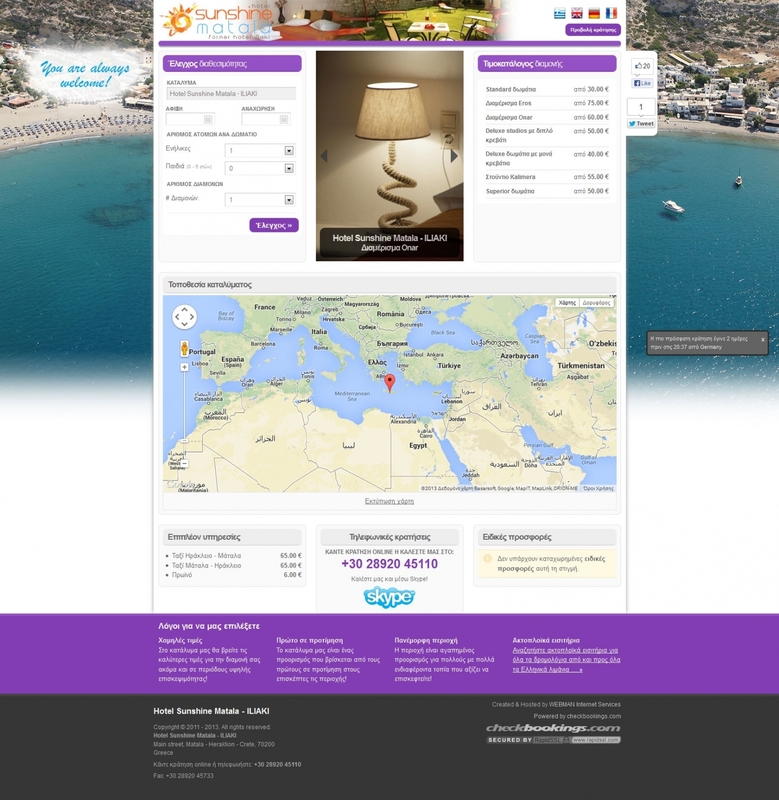 Font end is multilingual and user friendly giving the ability to your customers to book their accommodation fast! The administration is friendly and easy to use by making your life easier! 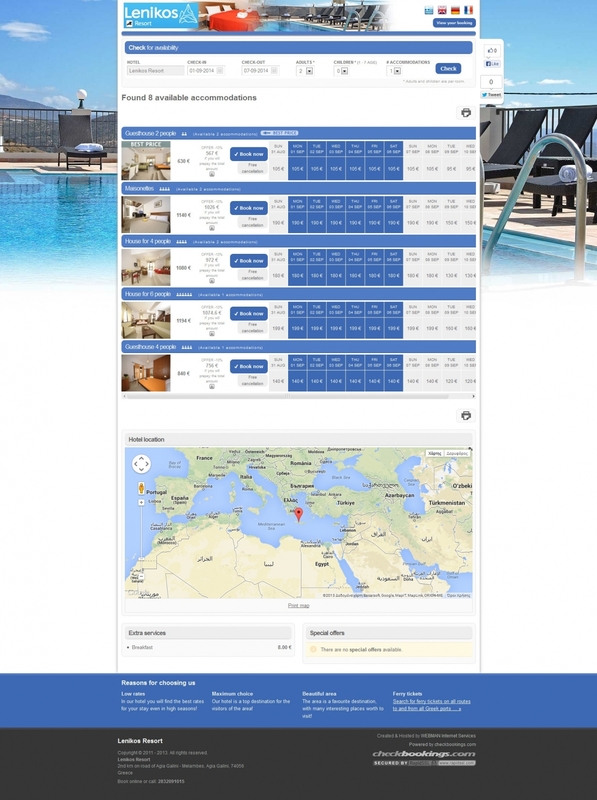 There isn't any faster way to check your hotel's availability plan! Availability is fully manageable and anytime you can change your availability or stop sales even in all types of accommodation provided without any commitment. 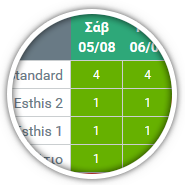 Our system differs because of its modern, clean design and easy to use environment! Check it out! Use it as your CRM! 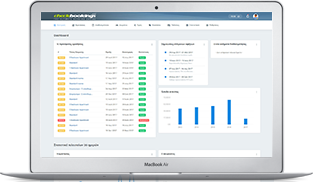 Check Bookings platform gives you the ability to add your own bookings in the system, free of charge! 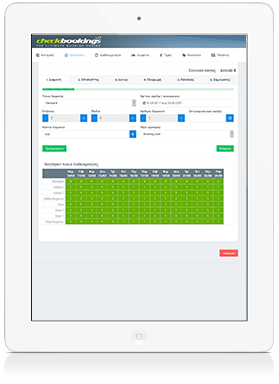 This means that you can add all of your bookings that have been made from many different sources and use it as your hotel's main CRM program. 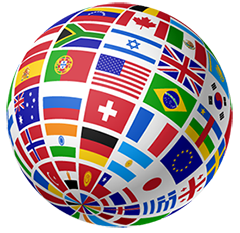 Your hotel in any language! 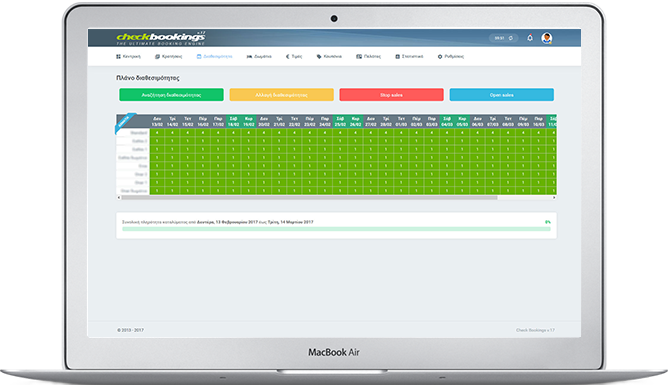 Check Bookings platform supports many languages, so the final result of your hotel's presentation will be in your client's language! Do you have special clients with different payment policy? 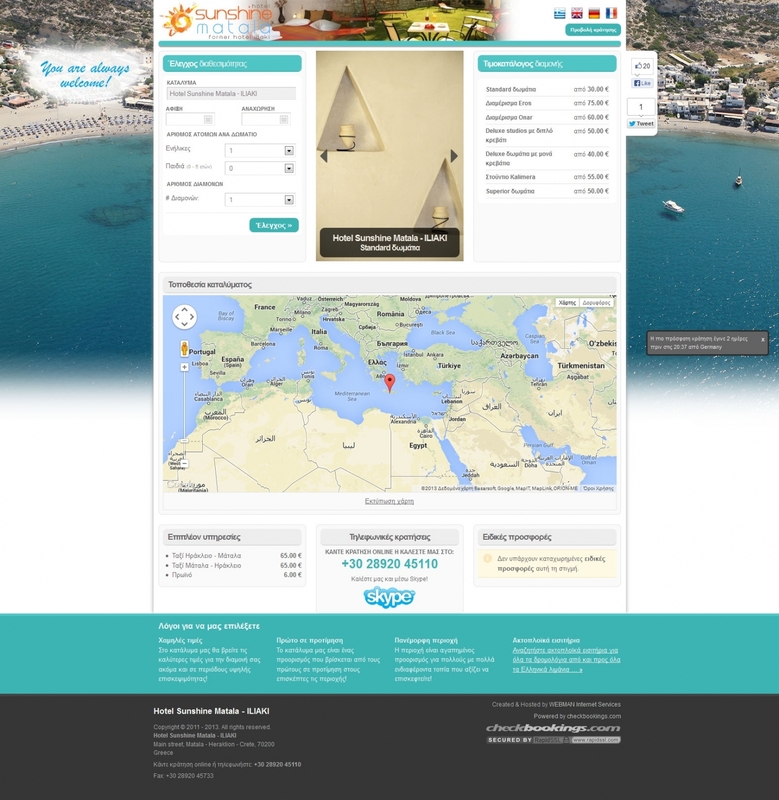 Just send them a voucher code with the prefered discount and they will book their accommodation in the desired price! 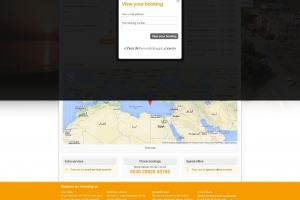 Check Bookings availability plan is well designed which makes it simple and clean! You can view your availability, check what is the price in specific dates and number of persons in each room type! 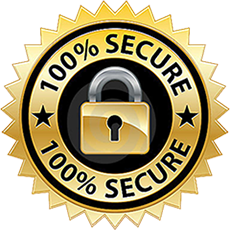 All of your data are secure in the servers of Check Bookings. A high-grade connection with encryption of 256 bit keys is running! 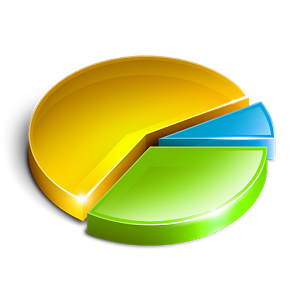 View detailed statistics about booking sales, requests and customers! Distinguish between years about bookings, costs etc. Free of charge & direct SMS alerts on your mobile phone! 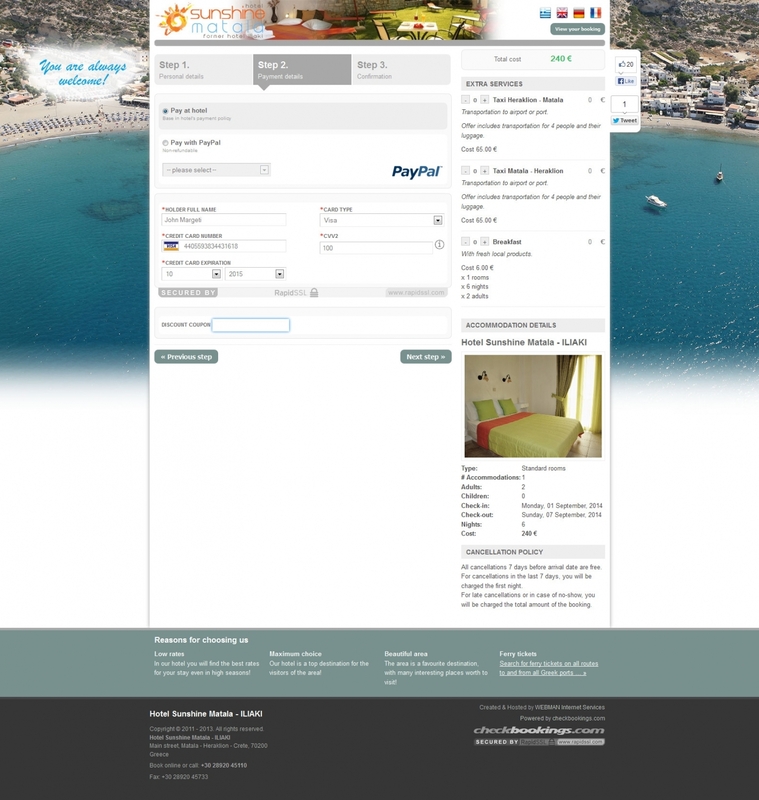 Check Bookings can be connected with PayPal and Eurobank's ProxyPay to let you direct receive online payments of your new bookings. 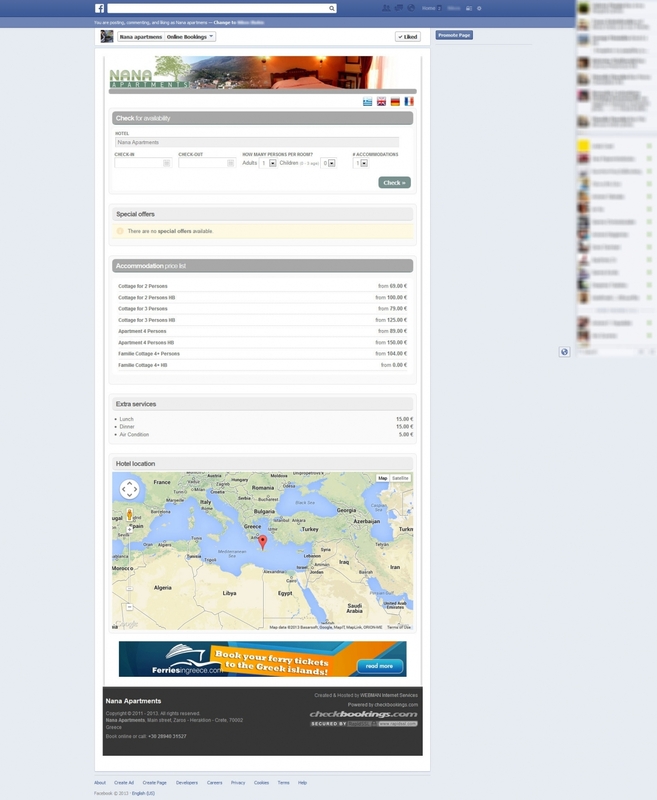 Check Bookings can be added on your Facebook fan page, so you will be able to receive bookings directly from facebook! After we will reveive your contact details, we will contact you in the next 24 hours to assist you! We are a certified partner which means that if you use Check Bookings, gives you the ability to add the engine in your hotel's Tripadvisor page by receiving direct bookings! Do it today and increase your bookings! Will be our pleasure to assist and inform you about all the features of Check Bookings! 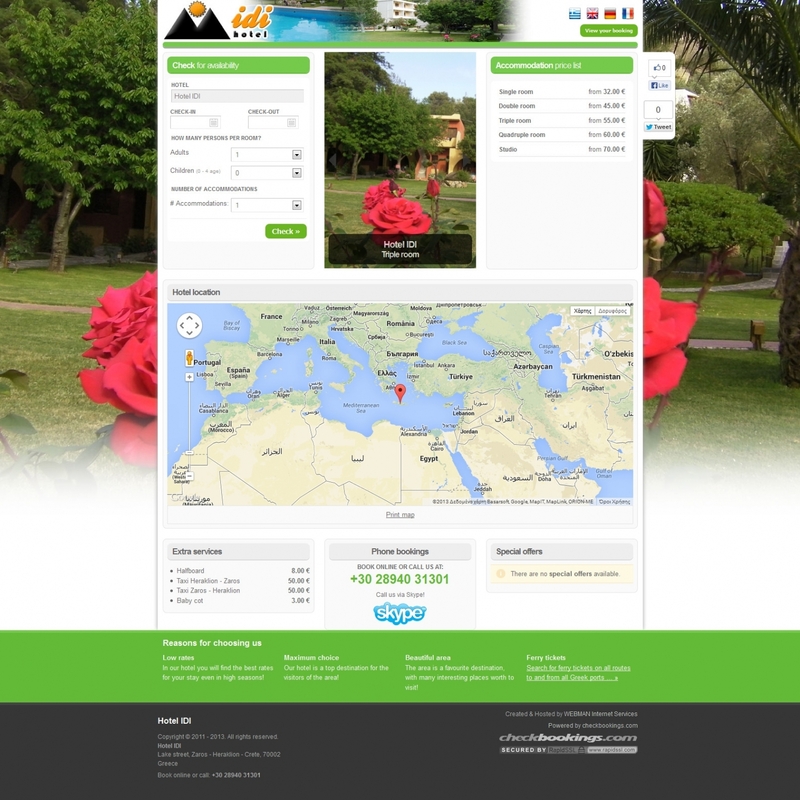 An ideal proposal for your hotel that will rise your business in a higher level!